A sleeping pad will give you the comfort of a padded surface without adding a lot of weight to your backpack. There are several different options to choose from for maximum comfort. Start with a low cost mat and figure out what your body needs before you purchase something more expensive. There's a reason why sound machines mimic the great outdoors—nature can be soothing. Listen to the stream run, frogs croak, crickets sing, and breeze blow to sooth your mind and relax your body. If these sounds are the reason why you can't sleep, invest in earplugs to doze off in silence. Be strategic while setting up camp. If it's hot, pitch your tent under a tree for shade. If it's rocky, move the rock or find brush and leaves to separate you from the ground. The best option is to find a new spot if your initial choice doesn't feel right. Sleeping bags are made specifically for certain weather conditions. For example, if you're in a cooler area and you tend to get cold easily, invest in warmer bag. When you're snug in your sleeping bag and there's a slight chill in the air, the last thing you want to do is get up to relieve yourself. Always use the restroom right before bed to rid yourself of any potential discomfort. If you have to go in the middle of the night, and it's cold outside, just go. Going to the bathroom will actually help you feel warmer and more comfortable while sleeping. Instead of fighting the sun, take a hike to see the sunrise. Make a great breakfast for your fellow campers. Read a book while sipping coffee. This way, your body will naturally be tired and make it easier to fall asleep at night. 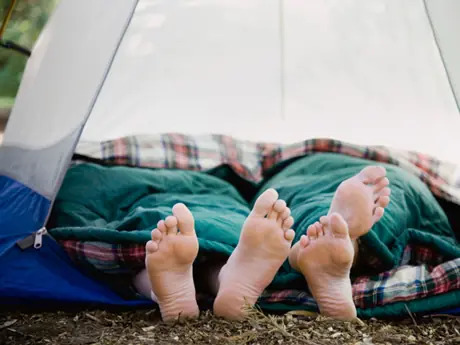 Use your usual bedtime routine while camping to help your body adjust to sleeping outdoors. Maintain your morning routine as well. Make note of all your issues—you need more padding or your sleeping bag is too cold—and actively seek out ways to improve them for each trip that follows. Mandie Pouwels is a contributor to ReserveAmerica.com and the founder of www.girlycamping.com. As an avid camper and outdoor enthusiast, she spends her free time backpacking in the mountains, hitting the hiking trails, or staying active at the beach. Follow her on Google+.